The world’s smallest museum has only one exhibit: A piece of Edinburgh’s executed grave robber and murderer William Burke. There is a museum in Edinburgh that says it is the world’s smallest, and with only one exhibit, that claim is hard to refute. But in this case it’s not the size of the museum that matters – it’s that lone exhibit, a single macabre object, that brought in over 15,000 visitors from around the world during it’s first year in operation. 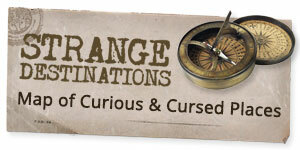 The William Burke Museum, located inside The Cadies & Witchery Tours shop, is home to a unique piece of Edinburgh history: A 19th-century calling card case made of what appears to be fine leather with gold tooling. Only it’s not leather. The case was fashioned using actual human skin, taken from the museum’s namesake after his execution and public dissection on January 28, 1829. William Burke and his accomplice William Hare were body snatchers. Scottish law stated that only suicide victims, criminals who died in prison, orphans, and foundlings could be used for dissections. 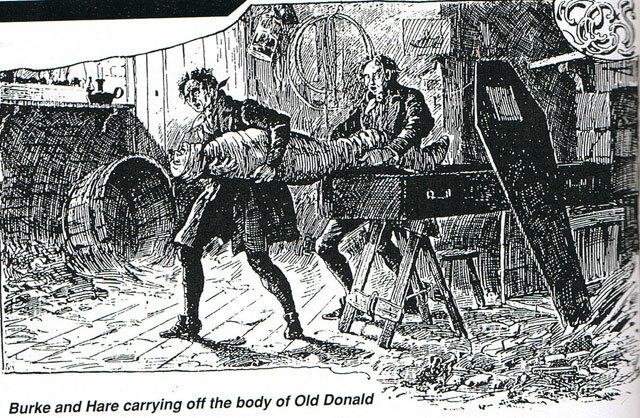 Edinburgh, one of Europe’s leading centers for anatomical study, needed more cadavers than they could legally acquire, so teachers hired “resurrection men” like Burke and Hare to keep them in steady supply of fresh corpses. Families began hiring guards to watch over fresh graves, or used deterrents like mortsafes, coffin collars, and other devices to thwart grave robbers and keep their loved ones in the ground long enough to become too decomposed to be useful to anatomists. This lead to a shortage of cadavers and a crisis for medical schools. Burke and Hare soon turned to murder. 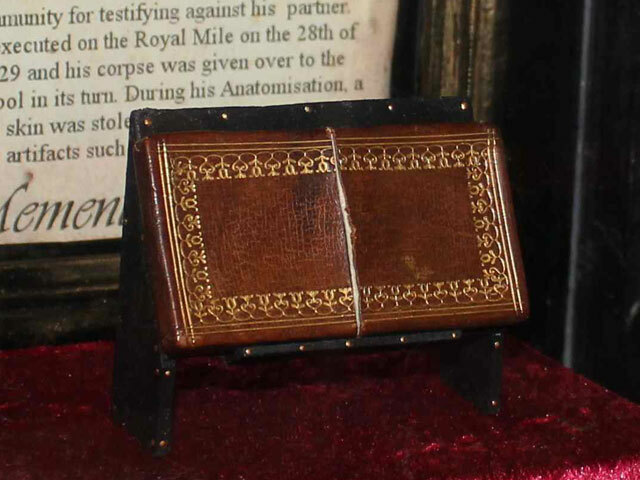 The calling card case now in the museum’s possession was made using skin from the back of Burke’s left hand. “The calling card case was owned for many years by a Dr Hobbs, and was handed down to the family of Piercy Hughes, a descendent of one of the surgeons involved in William Burke’s dissection,” the museum’s website says. Robin Mitchell of The Cadies & Witchery Tours bought the case at an auction in 1988, outbidding the Surgeons’ Hall, whose collection includes Burke’s death mask and an entire book bound in his skin. The case accompanied Mitchell’s walking tours of Edinburgh, until it was decided that it needed to be better protected. It was loaned to the Police Information Centre in Edinburgh’s Royal Mile where it was on display until it closed in 2014. 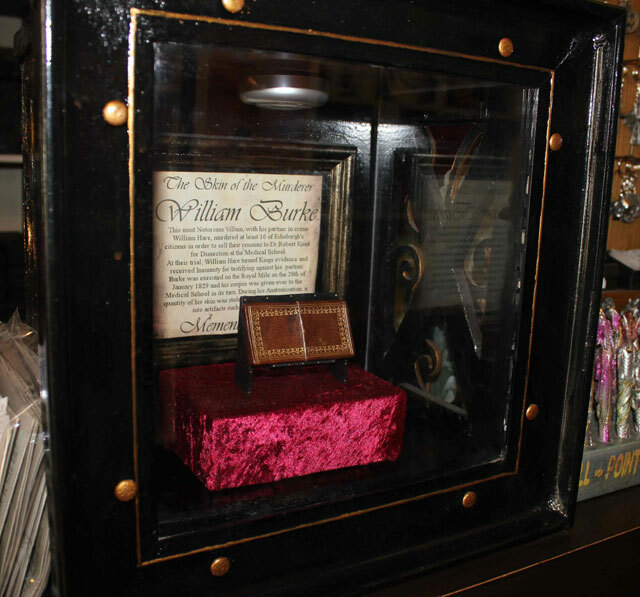 Then, last year on the 188th anniversary of Burke’s hanging, the William Burke Museum opened – a case containing the morbid relic on the counter of The Cadies & Witchery Tours shop. The museum is celebrating it’s one-year anniversary this month on January 28, so stop in and see a piece of history’s most notorious body snatcher. The shop is open 7 days a week from 11am-8pm. Entrance is free. Find it at 84 West Bow, Victoria Street, Edinburgh or go to witcherytours.com for more information.